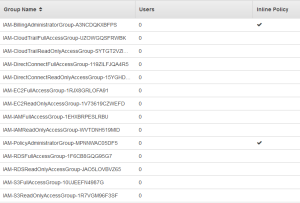 Using cloudformation you can quickly create a set of groups and roles that should quickly satisfy security folks mindsets. This does not include a “modify” set of groups. Still working on that. 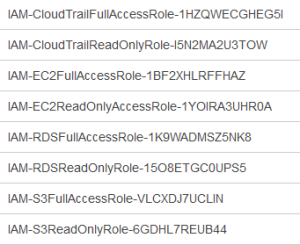 Be mindful that when you create things using Cloud Formation it tags them with stack name at the front and then a unique random identifier at the end. So group names are essentially “random” and unclean”. When scripting you could look for the strings inside the field to isolate a group however so it shouldn’t prove too hard. Note not every AWS Service has Role capability hence why the list for roles is shorter.